LONG BEACH ― The Port of Long Beach, a major commercial gateway, has plans to develop a couple new stations to house fireboats. The Harbor Commission consented to the fireboat station designs on June 12. A budget in the amount of $50.1 million for the construction of one station was also approved. The completion for this fireboat station construction on the main channel is expected to be in 2020. “These fireboat stations will safeguard the Port and our customers in this new era of big ships,” Port of Long Beach Executive Director Mario Cordero stated. “They will provide the best waterside response possible, maximize landside firefighting coverage and serve as a home for our new, state-of-the-art fireboats. 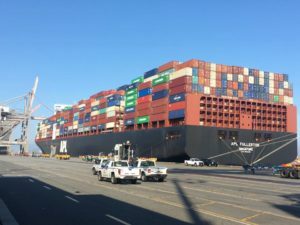 “With ships more than doubling in size in the last decade and cargo traffic breaking monthly records, this is a needed upgrade to Port safety,” Cordero continued. A request for proposals for the construction of these stations is expected later this year.